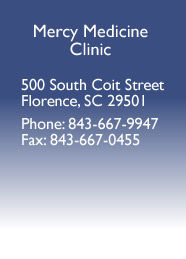 Medical clinics are always in need of supplies for its patients and Mercy Medicine Free Clinic is no different. Therefore, it’s no surprise that it takes numerous and varied types of supplies to efficiently maintain this mission. We are so very blessed to have the community bring in items that are so essential. From toothpaste and toothbrushes, to blankets and tissues, we are able to fulfill the mission of the clinic because of you who give. Please contact us by email at mmfcflorence@att.net or by phone at 843-667-9947 with any questions concerning the donation of any items.